ECO STYLE Tech Pro - Notebook carrying backpack - 16.4" - blackThe Pro lite Backpack is a fashionable lightweight backpack that fits up to a 15.6" laptop. Featuring an easy-access front storage pouch and exterior pass-through allows for attachment to a rolling case. The workstation includes cell phone/ accessory pocket, business/credit card holders and 2 pen holders. 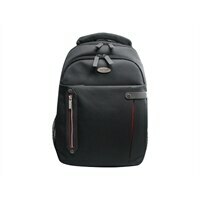 The Pro lite Backpack is a fashionable lightweight backpack that fits up to a 15.6" laptop. Featuring an easy-access front storage pouch and exterior pass-through allows for attachment to a rolling case. The workstation includes cell phone/ accessory pocket, business/credit card holders and 2 pen holders.